The weather has been a bit chilly and windy here in Salford, so for today’s vase I picked the brightest colours I could find in the garden – lots of different kinds of dwarf daffodils, including a solitary frilly one. Most of the Daffodils came from a mixed bag of bulbs from my local garden centre Bents. I added some bright yellow primrose, which opens as orange, and a frond of blue scilla. I matched them with an aqua glass vase, which I bought at the Eden Centre a few years ago – it’s made from reclaimed glass, has a metal hanger, handy for wedging stems against. The vase is really a tealight holder – it’s appeared before In a Vase on Monday, with daffodils but I didn’t realise that until I looked it up on the blog. There’s rain drops on the Primula and one of the Daffodils has been munched – oh well that’s Nature for you. I probably sound like a broken record, but the weather has been very backwards and forwards in April in Salford. It’s been even more changeable than usual for April, – and not many April showers either. There was the brief hot, sunny 70degrees for a few days mid week, which ‘might’ have been our Summer/Spring. It was rather wasted as I was at work, but it did give me a chance to take some photos around Oxford Road. 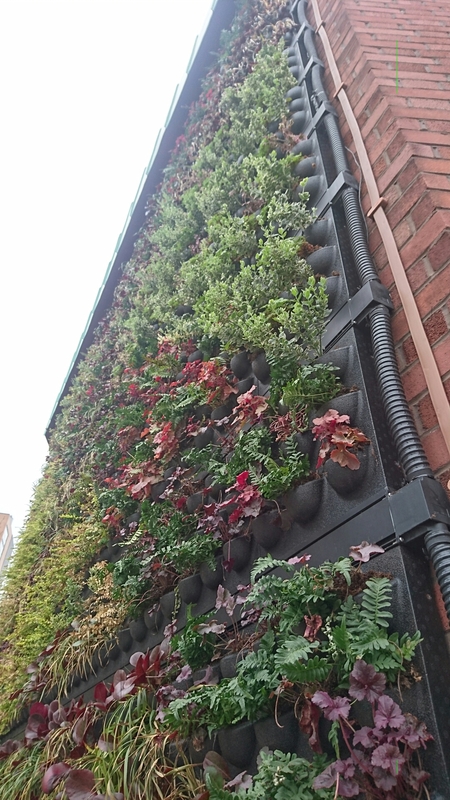 Doesn’t it look awesome and I love the living wall on the side of the Physics building. I wish there were more of these, and more Cherry trees around campus. Manchester and Salford look stunning at the moment with the many ornamental blossoms – I counted over 50 trees on the way home in so many shades of pink and white, on my 6 mile commute (and two miles in motorway in deep concrete cuttings). I must take some photos of the local ones around Monton – there’s four mature cherry trees on our Green, which definitely isn’t big enough for a cricket match. As usual I’m linking up with Cathy from Rambling in the Garden; she has a beautiful collection of many shades of white, with streaks of green when you look closely. Like many things, if you look closely you see more. A good reminder for life generally – and doing this helps me be mindful too. I’m expecting to have Tulips in my Vase on Bank Holiday Monday, there are many coming though. This finished today -Monday 30 April 2018. It’s been a reflective day for me. I’ve enjoyed the challenge of finding photos to represent the topics – sometimes it was very thought provoking, other times the photo and description were straightforward – some photos I had already and some I took especially for the prompt. I made a couple of collages too. I’d definitely do another of these prompts again. Have you seen anything suitable? Would you have a go? Let me know in the comments. Thank you to The Blurt Foundation for all they do to help people like me – I’d have been a mess if I hadn’t found them. I’ve written about them a few times on the blog. I can see my neighbour’s stunning cherry blossom from my front door. Isn’t it gorgeous? It lifts my mood. In the meantime enjoy National Gardening Week – hope you can get outside to enjoy some gardens, flowers and plants… or just a walk in the sunshine or doing something you love. It’s due to be a sunny Bank Holiday weekend so we’ll be making the most of it. I’ll be taking notice of the small things too – #mindfulness. I’ve tapped into more of my inner sunshine despite being ridiculously busy. We go to Australia in less than two weeks to see our awesome relatives so we will definitely see some genuine sunshine (inner sunshine too). This entry was posted in Manchester and tagged blurtfoundation, blurtselfcareathon, daffodils, In a vase on Monday, living wall, Manchester university, Photo challenge, Primula, scilla on May 1, 2018 by Bec - views from my garden bench.